I am all about party favors and making them cool. I hate the junk that comes home with the kids normally so I really try and got “out there” with my favor ideas. This year for my oldest boys birthday I made fishing polls. I wish I would have made more then one fish per kid but I ran out of time. Here is kind of a run down. I actually ended up changing how the magnet was on the fishing poll itself but you get the idea. Batting. I use cotton because it’s what I had here and I like that it’s now well, fluffy for lack of a better word. You also need a fish template. I hand drew mine. It’s roughly 5 and a quarter inches long. 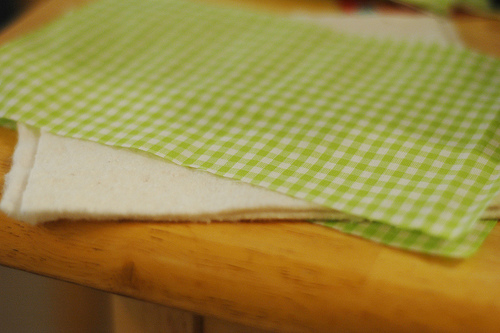 Start by cutting you fabric a little larger then the fish. I just did several rectangles that were about the same size as the batting I had left over from rag quilts I had made. You need two piece of your fabric for each fish as well as two piece of batting. 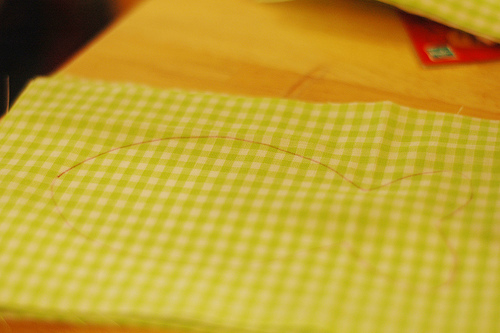 Once you have your fabric cut, with a disappearing pen, trace the fish onto the fabric making sure to leave room to cut around the fish when you are done. It is best to center the fish in my opinion. 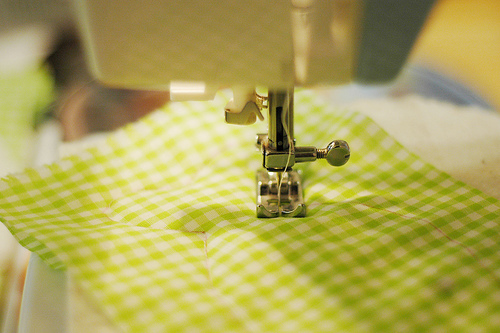 Batting sandwiched between the two layers of fabric, head over to your sewing machine. You could pin at this point but I don’t. It’s not that shifty and seems like a wasted step. 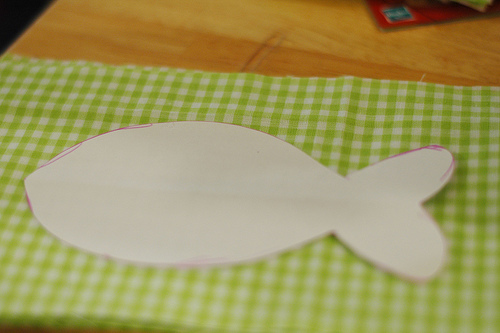 Sew along the ink line making sure to leave enough room open so that you can fit your magnet in later. This is where your pinkers come in. 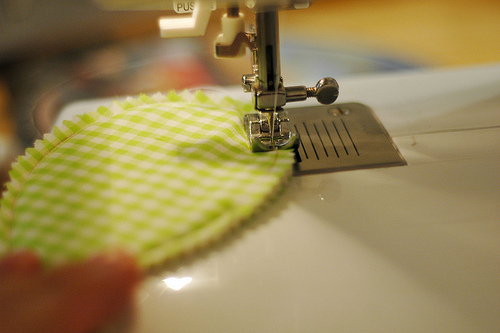 Carefully trim away the excess fabric and batting with your pinkers. This creates a fancy edged fish. Kind of a nice touch I think. From there stuff the magnet into the body of the fish pushing it to the nose. 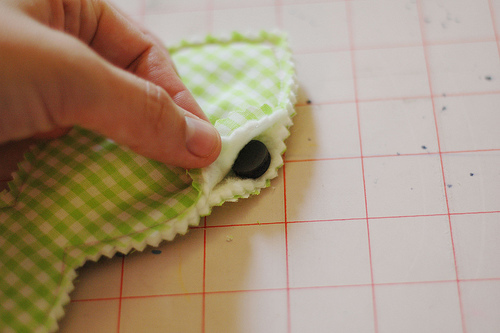 With your sewing machine stitch the opening hole close and also create a casing for your magnet. You want it to stay near the mouth because that is where you would catch a fish to begin with. It adds cuteness too in my opinion. Just sew a slight C around the edge of the magnet. I kind of use the shape of the magnet as my guide. And your fish is done. Cut off any loose thread and toss her aside for now. Grab your dowel and a 2nd magnet and drill holes in each. I just used a little hand drill that is next to the dowels at Michael’s craft store. I drilled a hole through the top of the dowel and the center of the magnet. Originally I tried to put the magnet in a pouch but it created to much “stuff” inbetween the magnet in the fish and on the poll to pick up the fish so the drilling option works much better. I however suggest you keep this toy away from anyone who likes to put things in there mouth because with a little spit I bet that magnet would come untied and off. Chocking hazard for sure. 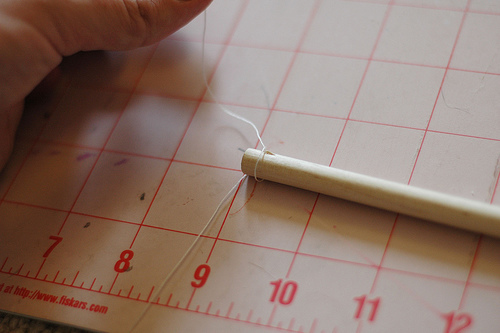 Take a good long piece of string and tie it through the hole in the dowel and the magnet and voila! You have a magnetic fishing poll and fish. I think it would be cute to do several colors and maybe at numbers or something for a teaching game. 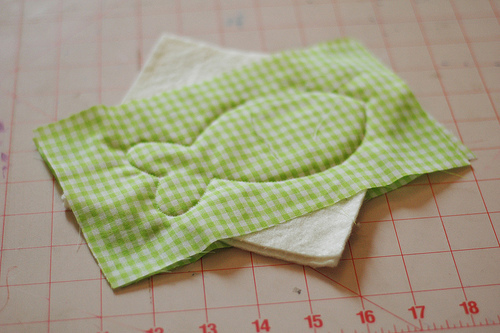 Look for this soon in my Etsy shoppe! Ooooh - my nephew would love these! I love this! Thank you for posting this tut. It would be really fun to have a little pocket in the fish to put a little treat in. 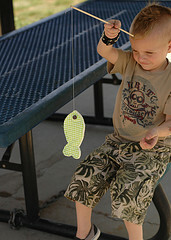 Or just tie, or velcro a little treat to each of the fish. Then the kids could keep the fish, pole, and treat. My boys love to go fishing, I do believe that when they ask to go fishing and daddy’s not home this would be a great alternative!!! Thanks for a great tutorial. 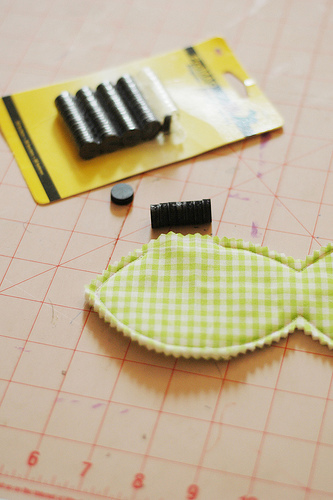 Such a cute idea I want to make an entire school of fish- just to have ;o). My girls will love this- Thank you! Wow! What an amazingly wonderful idea. Great way to teach kids basic hand/eye coordination. Splendid!!! 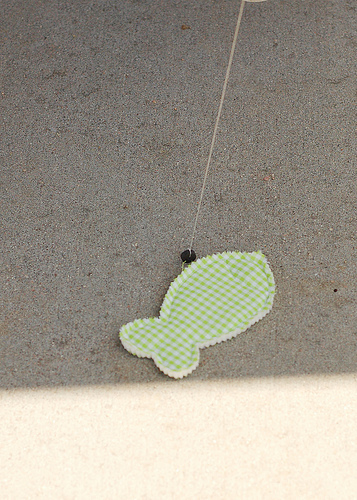 I’ve got a little fisher-woman here at home…..I can’t wait to make this for her. Please do not sell items made with my tutorials as they are for personal use only. All photos and etc are copyrighted ©. I share because it's nice so you be nice to, ok?